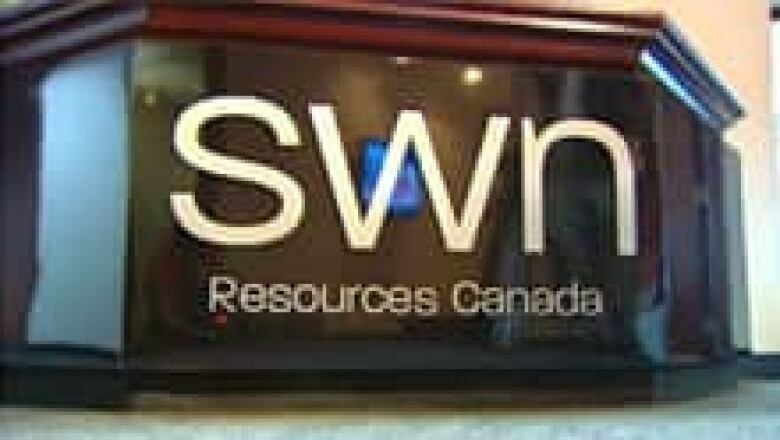 SWN Resources Canada intends to drill four exploratory wells in New Brunswick in the next phase of its exploration program for potential shale gas development in the province. SWN Resources Canada intends to drill four exploratory wells in the next phase of its exploration program for potential shale gas development in New Brunswick. SWN Resources Canada intends to drill four exploratory wells in New Brunswick in 2015. (CBC)​The company has initiated the environmental impact assessment process to move forward with exploratory drilling. But company officials say it will be next year, at the earliest, before the wells can be drilled. Public consultations will be held in the communities where exploratory wells are to be drilled. SWN says it will also be continuing its discussions with First Nations. The company will not carry out any seismic testing in New Brunswick this year. It will be surveying land and doing other preparations for drilling the exploratory wells, including site construction. Dave Morang is not happy. He says he bought 76 acres in tiny Saint-Charles to get away from the city, but now that SWN plans to drill an exploratory well nearby, his tranquil life will change. "I'm home here. I'm quiet. I'm with the animals and I love it. And now they're going to come and ruin the little nest that I built here to live on and retire," he said. "They're just going to ruin it because there is no way they are going to come in here and make one well and say, 'That's all we need.' If they do one, they'll do 10, if they do 10, they'll do 100. And if they do a hundred, they'll do a thousand. And once you're up in the thousands, there'll be no good water in New Brunswick." Antoinette Petitpas, who lives just down the road, agrees. "I don't like it at all. Not a bit," she said. "And I don't care if it's further up or further down. It's not a good thing to me." Chad Peters, SWN's new manager of explorations, said he realizes there are people opposed to the work the company is doing. "We'll keep trying to engage with them and try and educate the general population in what we do and how we do it," he said. Peters is reassuring area residents their drinking water will be unharmed. "We remain confident and secure that we can do this work safely with responsible environment management practices, as we do throughout our work areas in the United States," he said. "We're going to continue to do that here." The depths of exploratory wells range from 1,000 to 4,000 metres. The wells are drilled vertically and used to collect rock samples. The samples provide a better understanding of the geology of the region, indicate if there are hydrocarbons in the rock, and if so, their type. SWN says the wells are being drilled for scientific purposes and will not be hydraulically fractured at this time. The wells may be stimulated during future phases of the exploration program, stated the company. A new round of regulatory reviews would be required before that could happen, it said. SWN is carrying out the work to try and determine if there is the potential to produce shale gas in the province through hydraulic fracturing. The process involves injecting a mixture of water, air and chemicals into the earth under high pressure to fracture shale rock and release gas trapped within the rock formations. The prospect of shale gas development has sparked protests by people who fear the groundwater supply will be affected. SWN's seismic testing program in the Kent County area last summer was interrupted by protests. At one point, protesters took command of the company's staging area for vehicles and equipment and prevented the company from carrying out its work. The company eventually obtained an injunction against the protesters. When RCMP eventually moved on the protest encampment in Rexton in October, dozens of people were arrested and six RCMP vehicles were destroyed by fire in a day of clashes between police officers and protesters. The exploratory wells to be drilled in 2015 will have multiple layers of a special cement, and steel casing, which will protect groundwater, said SWN. The process from construction to drilling to capping an exploratory well will take about 90 days in total, but not necessarily 90 consecutive days, says the company. A well site is typically about three hectares, or 7.5 acres in size. SWN Resources plans to drill exploratory wells in N.B.